GRAFENWOEHR, Germany — Community involvement in antiterrorism awareness is one major key when it comes to the defensive element of our fight against terrorists or other potential threats. 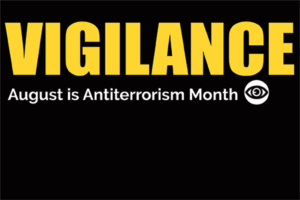 The intent of the Antiterrorism Awareness Campaign, including August as Antiterrorism Awareness Month, is to instill and sustain heightened awareness and vigilance within the community. Monitoring is the best protection that we have, and every member of our community plays an important role because everybody knows their own environment best. It is about the daily way to your workplace, your house, your office or the bus stop for the kids. At these daily situations, everybody is asked to be aware in order to detect and prevent acts of terrorism and protect the Army community and resources from their effects. “Everybody is a sensor. If you see something, say something,” said Command Sgt. Maj. Micheal Sutterfield, U.S. Army Garrison Bavaria Command Sergeant Major. Why is it important to report suspicious activity or behavior? On Sep. 17-19, three bombs exploded, and several unexploded ones were found in New York and New Jersey. Thirty-one people were wounded by the bombs. It could have been even worse, but two men found a suspicious bag at the train station in Elizabeth, New Jersey. They called the police because wires were hanging out off the bag. It turned out to be a pipe bomb. The police evacuated the area and the bomb exploded when a robot severed a cable. On May 1, a parked SUV with engine running, hazard lights flashing and driver nowhere to be found looked suspicious to two vendors, both Vietnam War veterans. The two men alerted a mounted policeman who contacted his colleagues. The police secured the area and found an explosive device with three propane cylinders and two five-gallon jerry cans, as well as firecrackers, wires and batteries in the car. The FBI infiltrated a group of six men to gather information after two employees of an electronic store alerted authorities. The six men had recorded video footage of themselves shooting weapons and shouting Allahu Akbar (God is great). The men took the video to the electronic store to convert it to a DVD. After investigations, it turned out that the group’s intention was to kill as many U.S. military personnel as possible at Fort Dix, a military base in New Jersey. They already spied out the base and had a detailed map as well as numerous weapons. Those stories show how reporting saved lives, and there are many more similar examples. If there is something suspicious in your environment, the easiest way to report is to use the Army’s iReport. An online report can either be done to counterintelligence (iSalute) or law enforcement (iWatch). You can also call the Military Police. Don’t be afraid to report. “We would rather have people report something that turns out to be nothing, than people who do not report and then it turns out to be something,” said Jerry Hollo, antiterrorism officer at USAG Bavaria.